The new kid on the autosomal DNA block is AncestryDNA from Ancestry.com, joining the Family Finder test from Family Tree DNA and the Relative Finder test from 23andMe. Autosomal DNA testing, remember, is the kind that works across gender lines so you don’t have to find a direct male line from father to son to son (YDNA or Y-DNA1) or a direct female line from mother to daughter to daughter (mitochondrial DNA or mtDNA.2) It tests DNA from all of the chromosomes except the gender-linked X and Y chromosomes,3 and helps you identify cousins to share research with. And when this self-confessed DNA junkie was handed a test kit at the National Genealogical Society conference,4 well, hey… I’ve said repeatedly I’ve never met a DNA test I wouldn’t take. My results came in this past week, and I’ve had a chance to play with the system enough to have a sense of where it shines and where it needs more work. This, to me, is one place where AncestryDNA shines. Comparable analysis at 23andMe simply reports me as 100% European. At Family Tree DNA, I get a little more information — it reports me as 85.86% Western European (French, Orcadian, Spanish) and 14.14% European (Tuscan, Finnish, Romanian, Russian) — but both have a large margin of error of 11.65%. So to the extent that you’re looking for clues to your geographic origins, this test is a strong contender. Linking up with cousins to extend your knowledge of your family tree is the big reason to do autosomal DNA testing. Here, AncestryDNA has some outstanding features — and needs a lot of work. Clicking on the Review Results button takes you to the details of your match — and it’s here that AncestryDNA shows its major strength — and its major weakness — in one and the same fature. It’s the fact that the results are tightly integrated with Ancestry’s online family tree system. Without the specific underlying genetic information, however — how much DNA you share with the other person and where in your DNA (on what chromosome or chromosomes) the common areas are — this comparison is less than useful. That level of detail is something other testing companies do offer, and that AncestryDNA may eventually offer down the road. Why this tree-matching is the great strength of the system is clear: if two people have well-researched family trees on Ancestry and a common ancestor appears in both trees, that’ll be highlighted immediately. Being able to see your ancestral origins on a map with the ancestral origins of a match is very helpful since often the real leads with this test are found not with surnames in common but rather when you find two families were in the same place at the same time. But it’s equally clear why it’s the great weakness: poorly-researched trees will show “common ancestors” that aren’t common at all, and if the other person doesn’t have a tree, the match is essentially useless. There’s no way to contact a match except through the Ancestry system, and — so far — there’s just not enough genetic information independent of the trees to help overcome brick walls. So my take on this: it’s a mixed bag that’s best for beginners in genetic genealogy. Not a bad way to start off for those who want a quick and easy way to see where they have matches, and attractively priced at the introductory price of $99. Once you get past the wealth of information being presented in a very attractive package, the one area where AncestryDNA most clearly does not shine is in the area of the interface. It needs a lot of work, and AncestryDNA is well aware of that. There’s a good reason why this is labeled a Beta system and why it’s described as a work-in-progress. There are only two ways to sort matches: by relationship and by date. And there are only two available filters: a reviewed-vs.-unreviewed filter (whether you’ve already looked at this match); and a starred-vs.-unstarred filter (you can highlight a match by clicking on a star icon to highlight that match for further review). It’d be terrific to be able to easily find matches where my tree intersects theirs or where we have particular surnames in common — and neither of those options is available yet. There’s no way yet to add a note to a match. And there’s no way as yet to compare two matches to each other, rather than just to me. All of these are features that are reported to be in the works. There’s no way at the moment for the system to tell you that a match whose results you’ve already reviewed has changed something in his or her online family tree. That change could highlight an ancestor in common or correct an error — and right now, you wouldn’t see it at all. That, too, is something that’s said to be on the horizon. Without that access, serious genetic genealogists simply aren’t going to make this test a priority. It’s just not useful to have a match described as “distant cousin, moderate confidence” or “distant cousin, very low confidence” without knowing what those terms mean. How much DNA do I share with that match? How long is the longest segment I share? Genetic genealogy is one of many tools we have today that earlier generations of genealogists couldn’t have dreamed of. Integrating paper-trail family tree genealogy with genetic genealogy — in the long run — is going to take us places neither could do alone. The theory behind what AncestryDNA is doing is first class, and the science is first class. The interface needs a lot of work to speed it up and make it easier to use, and access to the underlying data should be moved up the priority list. And the ultimate utility of this whole approach is only going to be as good as the work people put in to creating an accurate database of family trees. In a very real sense, this test using this presentation method is only going to be as good as its users make it. Thanks for the review, Judy – very timely, given that I just ordered mine earlier in the week. But, ugh…so if I want to make any use of matches, it appears I need to create an Ancestry tree? Am I like the one who does not already have a tree on ancestry? Yep, you’ve got to put together a family tree to make it useful. Anybody who doesn’t do that is going to get just about no use from this test whatsoever. And you’ve got about four weeks to get it done — that’s how long it’ll take from submitting the test to getting your results. I’ve had about 10 pop up with our common ancestor listed. The most exciting was a fairly close match through my maternal grandmother as that is the first I’ve verified through her line. I wish I knew what chromosome it was on! I’ve also had two that showed our common ancestor as being in a line that I have been trying to verify. Since it’s colonial and pretty far back I didn’t jump to conclusions, though, and in both of those trees I found another common ancestor on a completely different line. Fortunately both I and each match had trees that went back enough generations to see this. I would love to see those common ancestor matches but, alas, not yet at least. Having submitted my test a week after yours, hopefully my results will be showing up this coming week; can’t wait! Here’s hoping for similar clarification vs. my Family Tree DNA genetic percentages. And the map-plotting of my vs. a match’s birthplaces looks really useful, especially in comparing places in those German and Austrian areas that changed political boundaries so often! I was very pleased at how fast the test results came in, Nancy, so yours should be coming along soon. And yes, I think the maps have the potential for being very helpful especially once people realize they have to do very good paper-trail tree work for this to be the tool it can be. Thanks for the review. I’ve been wanting to “get into DNA” but not really sure where to start. Always learn a lot from reading your posts. I just got my results back last night, so have not had much time to check things out, but was pleased to have two clear matches show up in AncestryDNA. Both were predicted 4th-6th cousins — one a 3rd cousin on my mother’s side and the other a 5th cousin on my father’s side. One I had already found through other sources, but the second match is new to me. Guess what I will be working on later today! As you said earlier, Judy, it will take time but results should improve dramatically as more people participate and submit family trees. There is so much potential here as word spreads that it really does work! Potential, for sure, John. Let’s hope it gets developed well. Had my results for two months now. Total of 20 matches – 2 with 96% confidence that have been verified by paper trail/tree, 3 moderate confidence where we are both clueless about who our common ancestor is and the remainder low to very low confidence – 1 of whom has been verified by the tree as 6th cousin. Thanks so much for this post. I received my kit yesterday! Great information and happy to know that I have four weeks to get my trees up at Ancestry. Yep, four weeks. The turnaround was very good. Good luck with your results! Send my kit in last week, so maybe, I’ll get the results in about 3 weeks. Thanks so much for this post. Good luck to you, and thanks for the kind words. This makes it less than useful for adoptees who do not have family trees. Also in the experience of the members of the AdoptionDNA yahoogroup, the ethnic prediction is mostly wildly off base. It absolutely is less than useful for anybody who doesn’t have a family tree to compare. That includes folks who just haven’t put one together, as well as adoptees and those who discover a non-paternity event in their backgrounds. As for the ethnic prediction, I can only report what I see. I’m aware of the criticisms, and also aware of the caveats on the website that nothing is etched in stone. It’ll be very interesting to see how I test when the Geno 2.0 project kits are available. Thank so much for the info, Judy. I am waiting for my results. I don’t have a tree on Ancestry. I think I will GEDCOM just my direct line ancestors to narrow things down a bit. I still want to do a yDNA but I have to talk an uncle into it first. Neither of my living uncles have any interest. Without a tree, this results system doesn’t really work. Hence, I seriously question the DTC Consumerist values of Ancestry.com as a company. IMHO, they are failing consumers by not releasing data to consumers RIGHT NOW! Also, Geno 2.0 has pledged to not collect data on medically reliant SNPs. “The resulting chip includes approximately 146,000 SNPs, avoiding all known medically relevant markers and exclusively concentrating on ancestry informative ones.” Has Ancestry.com taken this same pledge? I don’t think so and perhaps that is the primary reason they are hesitant to release data from DNA Tests which belongs to the consumer! Other than GedMatch, what other 3rd parties are allowing comparison of Autosomal DNA Data at >1cM Segments for Consumers between data collected from FTDNA, 23andMe, and potentially Ancestry.com? How many of you are using simple MS Excel Spreadsheets? How many of you are engaged in the exploration for Rare Autosomal SNPs which may help better to ID putative relatives / putative genetic linkages? I am currently engaged in such an exploration for persons with a Welsh Heritage with connections to the R1b-L371 Y-DNA Haplogroup. I examine matching Autosomal segments between 1 – 3 cMs searching for very distant cousin relationships originating in Wales prior to 1700. This research leads me to fine scaled Genetic Homeland regions in Wales. This research is similar to the People of the British Isles Study. Thanks for your perspective, George. As a followup, this may help to further explain my above perspective / comments. So, as a lay person, and not as a law person, I have questions concerning what AncestryDNA can do with an Individual’s DNA Data or a Group’s DNA data. Industry trade groups, ISOGG and other Genealogy organizations have little or no influence on issues such as this and eventually I see the need for Federal Rules or Federal regulation in this area for DTC DNA tests for Genetic Genealogy purposes. George, I think you’re taking that comment out of context. The language you quote is preceded by this limiting language: All DNA testing performed by AncestryDNA on samples submitted for testing or by uploading a digital version of a DNA analysis is done for genealogical research only, including population and ethnic group-related analyses. Apples and oranges here. As much as I love Geno 2.0 — and I can’t wait — the fact is, it isn’t going to test nearly as much of your autosomal DNA as any of the tests from AncestryDNA, Family Tree DNA or 23andMe. It’s for deep ancestry, not genealogy. If you want to find cousins or use autosomal results for near-term genealogy, you’re going to need to test with one or more of the three commercial companies. Now that I have my own Ancestry DNA results (yes! 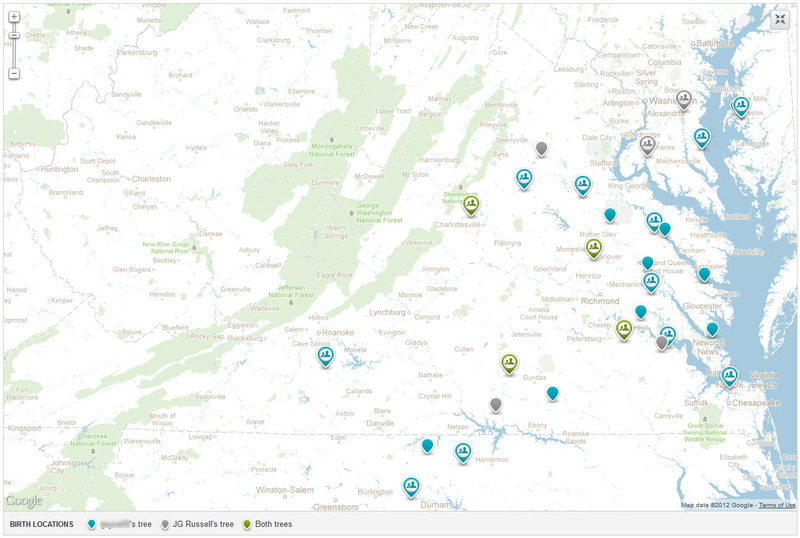 ), went back over your post to see if I missed anything… and I did: the maps comparing locations to other’s tree. Thanks for pointing out! One thing not mentioned that I found helpful was the tabs per ethnic element. First, each tab includes list of just those matches on the particular ethnic element. Also, as a newbie DNAer, i learned several things from the tab descriptions, e.g. Ashkenazi Jews may have descended from a small Jewish group in Italy over 1000 years ago. FYI, don’t think I had one slow moment and I’m running with basic cable speed – so perhaps those “around-the-corner” changes could have been made this past week? It sure does look as though those changes have kicked in. The page navigation is MUCH faster now, and that’s been reported by lots of users! I wanted to ask, is the ancestry info separated by your father’s or mother’s side or are they just kind of lumped together? For example, would it give you a separate list of your genetic mixture on your father’s side and a separate list for your mother’s? They’re lumped together in the autosomal test, David, because all of your autosomal DNA is a random mix of your Dad’s DNA and your Mom’s. To trace just your father’s side, you want to test your YDNA and to test just your mother’s side you want to test your mtDNA. Different tests for different purposes. I took the AncestryDNA test and I received numerous potential matches, one a projected 3rd cousin and after contacting that person, they were indeed my 3rd cousin. Other researchers have taken ONLY either the yDNA or the mtDNA and not the AncestryDNA. Are any yDNA or mtDNA test results from those people included in my AncestryDNA potential matches? OR, must those people who took the earlier y and mt tests need to take the new ancestryDNA to be included in my potential matches? Thanks for the kind words. Yes, to be included in your AncestryDNA matches, the other person must have taken the new AncestryDNA test. That’s because the matching is done by a totally different system, looking at a totally different part of the DNA, than the earlier yDNA or mtDNA tests. My vote is with Ancestry. Their databases are just too massive to be beat. Their database size is essentially irrelevant without the availability of the raw data with tools that allow for real comparison of the data. Knowing that I match somebody without any effective way to really investigate how I match that person isn’t a whole lot of help. 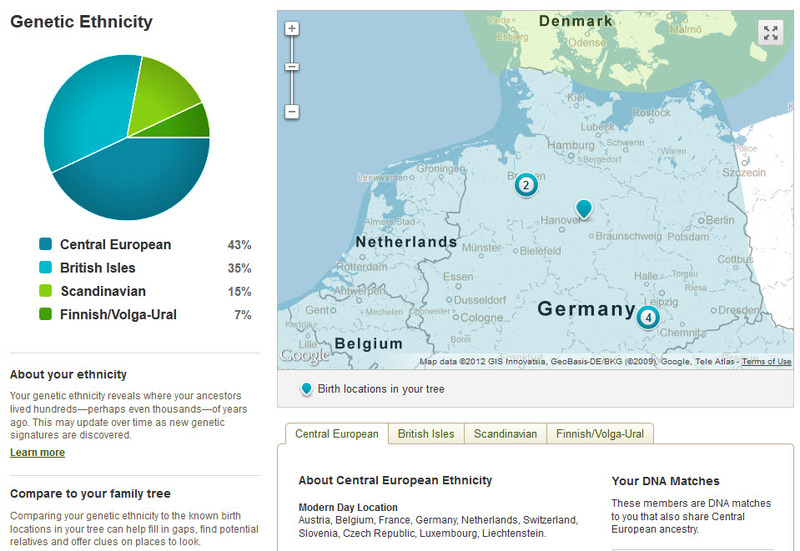 I was wondering if you know where my German ancestry might have gone? I took the DNA test and was shown to have these results: 70% British Isles, 15% Scandinavian, 13% Persian/Turkish/Caucasus, and 2% uncertain. My grandfather has a lot of German ancestry, and I was wondering why that didn’t show up? Lindsay, I keep singing the same old song: it ain’t soup yet. All of these numbers are little more that cocktail-party-conversation pieces so far. The science just isn’t there to support the claims yet. Remember that what they’re doing is comparing your DNA to the DNA of people in their database (not people in general) who live in the places today where our ancestors may have lived years ago (so there’s that mismatch as well). And AncestryDNA in particular has already announced it will be revising its admixture percentages later this year particularly because of the overreporting of Scandinavian in all our results. So sit tight — we have literally years of scientific research to go before the numbers reported actually mean anything.